This casual combination of a black ruffle crew-neck sweater and a Valentino Medium Garavani Candystud Shoulder Bag is a solid bet when you need to look stylish but have no time to spare. Upgrade your ensemble with black leather ballerina shoes. If you're all about relaxed dressing when it comes to fashion, you'll love this super cute pairing of a grey vest and a black studded leather crossbody bag. Bring instant glamour to your look with black suede heeled sandals. If you're all about practicality dressing when it comes to fashion, you'll love this totally stylish pairing of a pink blazer and a Valentino medium garavani candystud shoulder bag. And if you want to instantly up the style ante of your look with one piece, add black leather double monks to the equation. If you're obsessed with functionality dressing when it comes to fashion, you'll love this extra adorable combination of a black crew-neck sweater and a Valentino medium garavani candystud shoulder bag. When it comes to shoes, this outfit is complemented really well with black leather gladiator sandals. If you're a fan of functionality dressing when it comes to your personal style, you'll love this totally chic pairing of a black lightweight trenchcoat and a Valentino medium garavani candystud shoulder bag from farfetch.com. A pair of black leather ankle boots adds some real flair to this ensemble. If you're all about relaxed dressing when it comes to your personal style, you'll love this adorable combo of a black leather biker jacket and a Valentino medium garavani candystud shoulder bag. You could perhaps get a little creative in the footwear department and spruce up your ensemble with black suede over the knee boots. If you're obsessed with relaxed dressing when it comes to fashion, you'll love this extra cute combo of a tobacco coat and a Valentino medium garavani candystud shoulder bag from farfetch.com. White leather pumps will instantly smarten up even the laziest of looks. 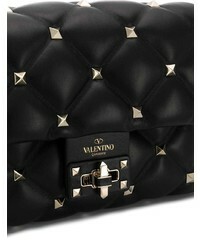 Team a navy coat with a Valentino medium garavani candystud shoulder bag from farfetch.com to be both casual and killer. Opt for a pair of green rain boots for a more relaxed vibe. 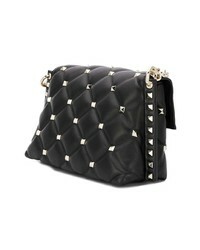 We're all seeking comfort when it comes to dressing up, and this combination of a black leather biker jacket and a Valentino medium garavani candystud shoulder bag is a wonderful example of that. Up the cool of your getup by wearing black leather loafers.